Quick database editor, designed especially for professionals dealing with massive data processing, but also for "laymen" who with the use of information in databases come together. 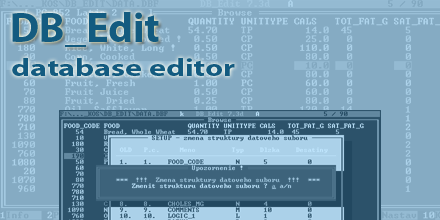 DB_Edit provides complete information about the data file, will scan the data in the "Browse" or "record" supports editing of individual log entries, add a new record, indicating deletion or activation record, physical deletion of marked list, search for a particular string by following items or whole, export data to text files, special import-export functions, editing and sorting functions, convert code pages, modifying the structure of the data set and many other useful features. including data memo files DBT and FPT. DB_Edit application was designed for the operating system MS DOS. It is now possible to use the DOS emulator. Reference Guide with key for the database editor DB_Edit.